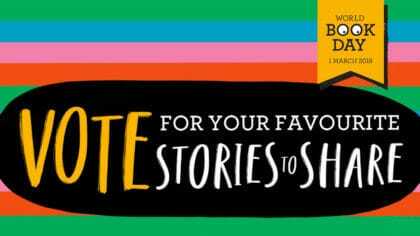 Vote for your favourite stories to share, ready for World Book Day 2018! We want to know the nation's 100 favourite stories to share! You can nominate your favourite stories to share on the World Book Day website. There are loads of different categories and you can choose as many books as you like. Plus, if there’s a great title you think someone’s missed off – you can add it yourself! To say thanks for taking part, World Book Day are even giving away five £20 National Book tokens! Voting closes on 15th January and we’ll reveal the ultimate list on World Book Day 2018!